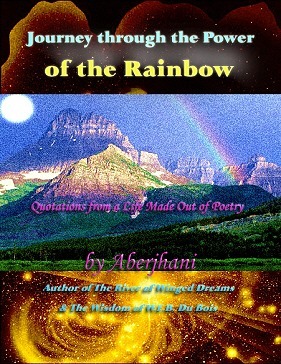 The book Journey through the Power of the Rainbow, Quotations from a Life Made Out of Poetry, contains a full chapter of quotes on Michael Jackson as well as the short essay below. Anyone interested in winning a free copy of the book is encouraged to check out the Goodreads book giveaway widget at the end of the essay. Michael Jackson fan poster featuring a Spanish translation of quote by Aberjhani. Graphic art provided by the Facebook Group Blues Away. At least part of worldwide reading audiences’ growing familiarity with my work has to be attributed to the late “King of Pop” Michael Jackson. Although I started writing about Mr. Jackson’s life and legacy after in his death in 2009, I did not understand just how many people around the world had been taking note of those writings. Then it was brought to my attention that several full articles had turned up on multiple websites in the form of unauthorized translations into German, Italian, French, Spanish, Greek, Portuguese, and other languages. Given the ease with which Internet technology makes it possible to accomplish such linguistic feats––precision of the translation notwithstanding––I told myself it had been inevitable. Technological ease was only part of the reason. Another very significant part was what I had sensed myself and what author and Minister Barbara Kaufmann had identified as the “spiritual emergency” into which Jackson’s fans around the globe had found themselves plunged upon his death. They had discovered little to no consolation within a mainstream media and sideline tabloid press that continued to employ guerrilla decontextualization to sensationalize and capitalize off distortions of the megastar’s image even as the worldwide community he left behind flailed about in a tsunami of unrelenting grief. Rev. Kaufmann herself has addressed with exceptional precision, knowledge, and compassion the needs of that community and the seemingly unending complexities that engulf Mr. Jackson’s legacy through her Inner Michael website and acclaimed Words and Violence education project. In an effort to help balance the often overwhelmingly negative reports (substantiated or not) filed on Jackson, the Argentinian fan group called Blues Away produced a series of digital art images featuring the “King of Pop” with Spanish translations of text from the essay and poem, “Summer-Song Rhapsody for Michael Jackson.” These were produced for non-commercial purposes specifically for the MJ Fan community. Because I recognized the difficulty so many had (and which some still have) coming to terms with Mr. Jackson’s death, it seemed important to support the alleviation of this particular spiritual emergency in whatever way I could. I therefore welcomed the addition of my text to these digital posters which, like Jackson himself, had gone beyond boundaries of race or nationality to embrace the humanity of those who needed so much to be embraced. Giveaway ends June 10, 2014.